This past weekend Birch and I went backpacking so that we could finish the New Jersey portion of the Appalachian Trail. Getting to NJ 94 wasn’t easy. There were very few shuttle options from our drop off point to the trail head. For this reason, we had to settle for a taxi service with a late pick up time. As we waited for the taxi the wind began to blow and the flurries began to fly. This was not going to be a warm weekend! The first part of the trail is known as the “stairway to heaven”. 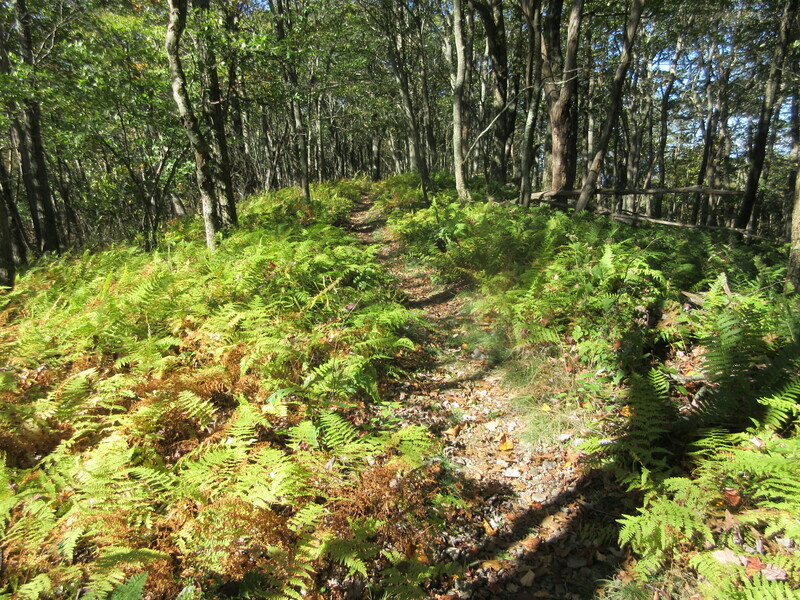 It is a short (1.4 mile) but steep ascent up Wawayanda Mountain that is fortunate to have many sets of stairs that make the hike interesting. There were a ton of day hikers who went up to enjoy the beautiful views. We, however, had mileage to make! Unfortunately, our late start and the early sunset made it impossible to get to Wawayanda Shelter as we had hoped. Instead, we filled up with water at a stream just south of Barrett Road, crossed Barrett Road, made our way into the woods, and resigned ourselves to setting up camp. The sun was low, so we only had time for a cup of coffee and a cold sandwich before hitting the sack. 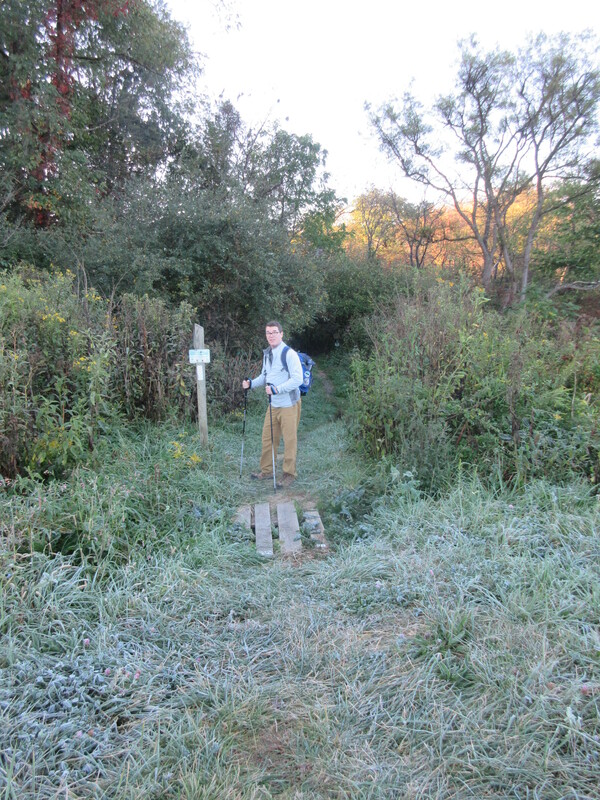 In the morning, we quickly made our way past Wawayanda Shelter and through a beautiful wooded area. After lunch, we began our climb up to the ridge. This included several places where I had to scramble and one area that had a very cool ladder that took us up to the ridge and across Prospect Rock to the highest point on the AT in New York. Again, we saw some day hikers who had come up to the area from a side trail. Once on the ridge we came to the New Jersey – New York state line. Another state complete! This section of the New Jersey/ New York AT was surprisingly challenging. Although there is very little change in elevation, the ridge requires lots of short climbs, up and down, over a series of rocks. This slowed us down considerably! Another challenge was that the leaves had recently fallen on the trail, making following the trail very difficult at times. Thank goodness for the great job that the New York New Jersey Trail Conference did with its blazes. It saved us! Instead of making up time from the previous day, we resigned ourselves to stopping short of the next shelter. Given our time constraints, we agreed to end our hike at New York 17a the next day. Weather throughout our trip was cold. After a warm dinner we tucked ourselves in for the night and when we awoke our water bottles were frozen. However, we had plenty of warm weather clothing, sleeping bag liners, and other gear that made us able to enjoy the trip despite the cool temps. The last day we had a very short hike to make it to our destination. Once off the ridge, the hike was very easy. We look forward to coming back when the weather warms up a bit. It is the last weekend in September and we were excited at the prospect of hiking in sunny weather! Our trusty shuttle driver, George, dropped us off at Culver Gap early in the morning and we were able to make quick progress from Culver Gap to the fire tower, about two miles away. The view from the top was basically non-existent, given that it was very foggy. But it was beautiful nonetheless. 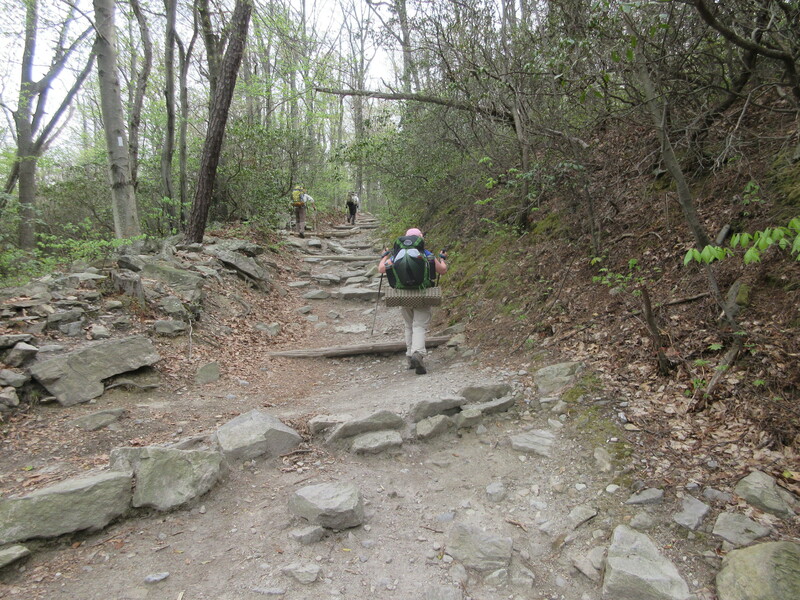 This section of the AT is flat but rocky. The biggest challenge was not the trail itself, but the incredible amount of water that turned the AT into a swamp. There were places where we had to navigate way around the trail in order to avoid moats. The first day we had the pleasure of seeing the Sunrise Mountain pavilion, an enormous stone structure with beautiful wood beams and breathtaking views. The highlight of the hike was an amazing encounter with “Maps.” We first met Maps at Guyot Shelter in New Hampshire, the day that Birch had terrible knee pain. As we turned the corner on the New Jersey trail, we saw him sitting on a rock taking a break. “Hey, I know you guys,” he said! What were the chances of us meeting up with him again? Maps had completed the northern part of the trail and had flip flopped in Connecticut. We wished him well and hope he makes a ton of progress this Fall. We stayed overnight at Mashipacong Shelter. Built in the 1930s by the Conservation Corps, the shelter itself is kind of dark and low to the ground. It had a nice lawn in front of it and it is here that we decided to set up our tent (not realizing that we probably could have gone into the woods for more private tenting options.) This shelter does not have a water source, so Birch carried 6 liters of water with him so that we would be set. However, the shelter caretaker supplied the shelter with gallons of water, set in the bear box. We enjoyed a restful afternoon at our tent spot, reading and drinking coffee. We were amused to see many dogs, in all shapes and sizes. Two stayed at the shelter, including “Millie” (or Mildred when she was in trouble), an affectionate boxer with a bright blue coat that kept her warm. It was a chilly night but we slept well and were up and out of camp before 8 am. The remaining part of the trail was just as wet but it offered some beautiful views. The mile just south of the High Point State Park office was about as muddy as it gets. All in all, it was a great fun and we look forward to completing New Jersey soon! Once again, Maple and I enjoyed the shuttle service provided by George Lightcap of Newton, NJ. He picked us up promptly at 8:30 at Culver’s Gap and transported us, together with a fellow hiker, Glenn, to Millwood/Blairstown Road. After a couple weeks of rain, it was fortuitous to have a day of sunshine, with clouds—even though the humidity was rather high. There were a couple of places requiring scrambling and hiking over a rock field, but overall, I’d say that the 10.9 mile hike to Brink Road Shelter was easier than the average AT hike. What made it more difficult for Maple was that one of her hiking poles broke during the first mile. It snapped in two where the sections joined together. We tried using duct tape, but that solution failed miserably. I saw several salamanders and frogs on the trail during this trip—perhaps, because of all the rain we’ve had recently. Just before leaving on this trip, I purchased a second Helinox Chair Zero—an excellent chair to bring backpacking, weighing only 1 pound each. I carried both, and Maple and I were able to enjoy a nice lunch break at a place that had no convenient rocks or logs to sit on. Just before climbing Rattlesnake Mountain, we came to a nicely constructed bridge over a brook, compliments of the Boy Scouts. Rattlesnake Mountain was, I think, the most precipitous and rocky ascent that we had this day, but the view to the north from the top was certainly worth it. There we stopped and took a short break. When we got to Brink Road Shelter, we found that the ground in front of it was under water. The water stretched out over the road, and most of the way toward the spring—so it was no simple task to make our way to the spring to fill up our dromedary. Once we got there, we found that our water filter would not pump. Ultimately, we decided to take our chances, and take our water directly from the source of the spring, without filtering. We awoke in our tent on day two to the sound of light rainfall. This was not in the forecast. In fact, the weather report said there was no chance of rain in Newton, just ten miles to the south. Even so, the sprinkling was not bad, and Maple and I got out of our tent and enjoyed a cup of coffee and oatmeal for breakfast. We didn’t get far on our second day’s journey, without noticing the saturation of the forest with spider webs. Webs crossed the trail, and we both had to use our trekking poles to clear the way before us. After about an hour, we were out of the spider infested forest. Soon we had to make our steep descent from Kittatinny Mountain to Culver’s Gap. We had fun, and look forward to continuing our journey in two weeks. Birch, with Culver Lake in the background. AT: Delaware Water Gap to Millbrook-Blairstown Rd. 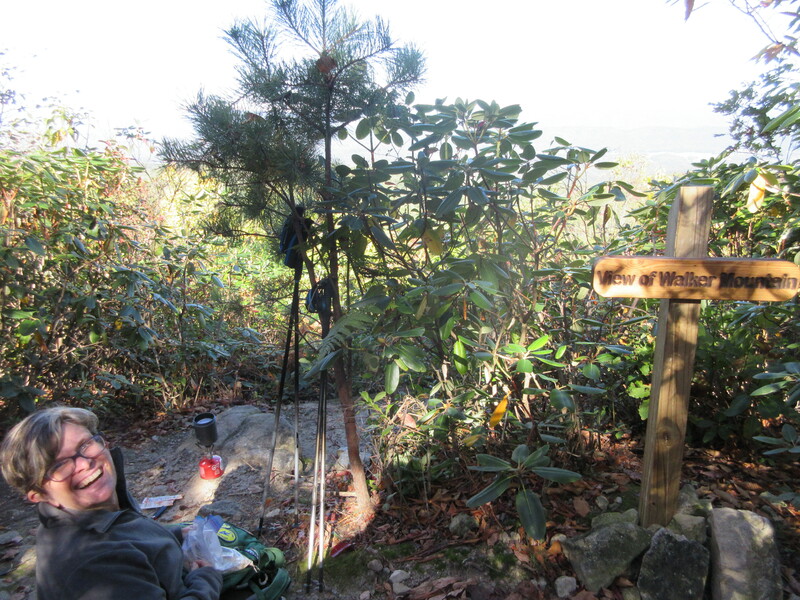 Last weekend Birch and I resumed our northbound progress on the Appalachian Trail. After so much time going south to complete Virginia, we were happy to be back in New Jersey. We dropped our car off at a parking area on Millbrook-Blairstown Rd. and were shuttled to the Dunnfield parking area by a shuttle driver named George Lightcap. George was a wealth of information, super helpful, and very encouraging. The trail starts near a stream and then winds up a gradual incline for about 3 miles before reaching the top of a cliff and the Campground #2 tentsite. 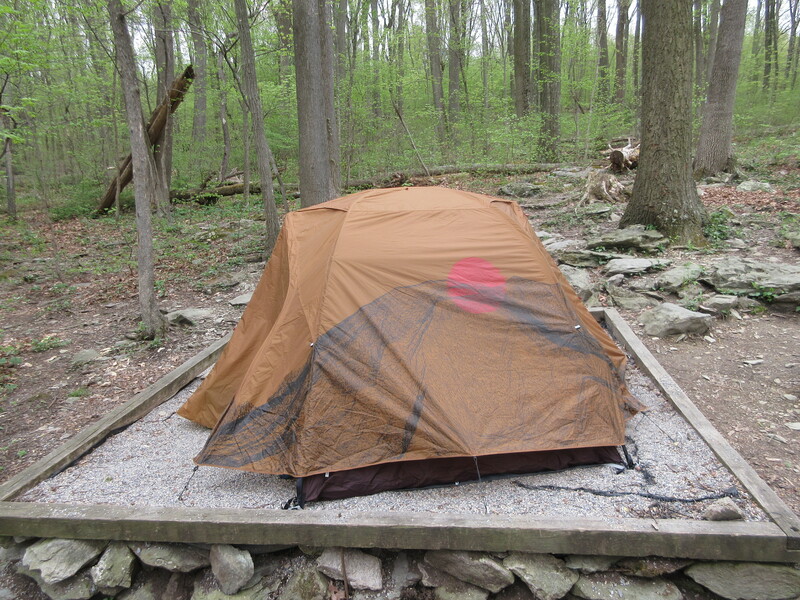 There are a ton of tent spots here, many with impressive views of the the Worthington State Forest, the river, and the New Jersey/Pennsylvania border. The site includes bear boxes and a couple of privys. Birch and I set up our tent under a tree and had the entire afternoon to relax. Each of us brought our Nooks so that we could read and we even brought a luxury item – a camp chair! As you can tell, this wasn’t a heavy hiking day. This was a day to just enjoy the trail and the outdoors. The next morning we broke camp and continued north on the AT. It was flat and not too rocky. Before long, we reached the south side of Sunfish Pond. It was designated a National Natural Landmark in 1970. The trail around the pond was very rocky but it was fun to be by the lake and to see the frogs jumping into the water as we approached. About halfway around the lake there are sets of really cool rock sculptures. After leaving the lake we hiked onto Raccoon Ridge. Here, we came to the Herb Hiller Overlook for hawk observation. Two men had binoculars glued to their faces. What were they looking at? A broad-winged hawk, we were told. This area is an ideal spot to watch the migration of hawks, we learned. This will happen mostly in September. One neat thing about this area is that it has an owl decoy perched on a long pole. Why? Who knows! About 11 miles into our overall hike we passed the road to the Mohican Outdoor Center where there is a beautiful stream. Then, we ascended up to a ridge where we stopped for lunch and had some incredible views. After a few miles we reached the Catfish Outlook Tower. Here, the trail becomes more like a fire road. It wasn’t long before we were back to our car. It has been a very wet spring and summer in Maryland! Birch and I decided we couldn’t wait for nice weather to hit the trail so we planned a short hike from Harpers Ferry to Gathland State Park. We had done this hike before, only in the opposite direction. Just as we got to the Harpers Ferry parking lot it began to rain. It was a gentle mist but we were ready with our full rain gear. As we crossed the bridge next to the railroad tracks, it was interesting to see just how fast the river was flowing. The heavy rainfall this spring definitely shows itself in the water below. 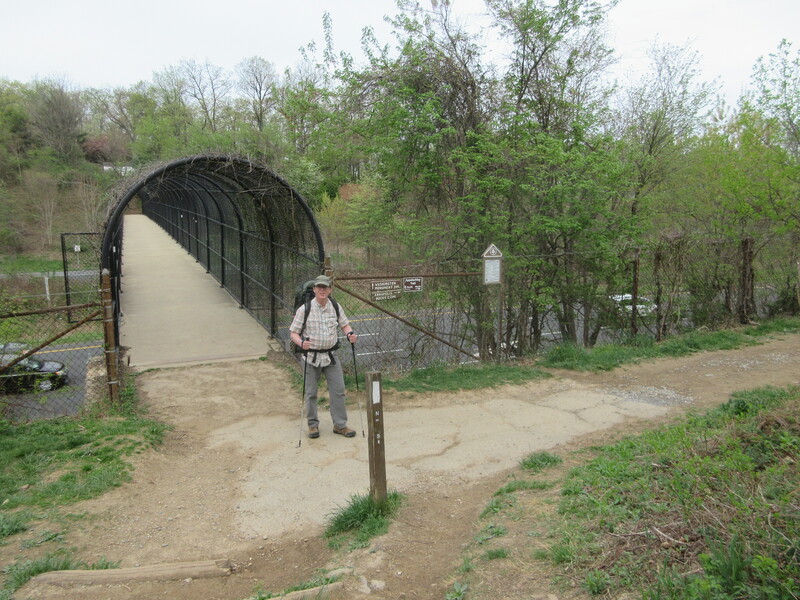 Before long we were on the smooth, wide C&O canal path that is also the AT. It was a very easy hike for the first couple of miles but the rain didn’t make it easy. It POURED! We heard thunder in the distance but never worried that it was dangerous. The real challenge was navigating all the huge puddles that formed. We zig-zagged along until we got to the point where we crossed the railroad tracks and began ascending the mountain. I remembered this section of the trail as being very steep. I was really glad to see that our latest workouts seem to be paying off because Birch and I never even had to stop to catch our breath. We just scurried up the hill! Once on “top” we still had to contend with areas of puddles but it didn’t take long before we were at the Ed Garvey shelter – the only ones there! Our tent, among a sea of others! One feature of this location that is a real bummer is the water access. The guides put the spring at .4 or .5 miles away from the shelter. This is true. The tough part is that it is a very steep trek down to the water source. Many people decided that it was easier to wait until they got to Gathland than to load up with water here. The water source was really good, though. The next day we packed up and quickly traversed the 4 miles back to our car at Gathland State Park. I really like this part of the AT. It may not be super strenuous, but it provides an excellent opportunity to get outside. We awoke at 5:00 on Saturday, May 5, expecting rain, but finding that the forecast had delayed rain until 1:00. We hustled out of our home with two cars, parked one at our destination at Pen Mar Park, and then retreated to our beginning point where the AT crosses I-70 near Greenbrier State Park. The first flip-floppers that we met were Kool and Kats (pictured ahead of us on the trail), who had spent the night at Pine Knob Shelter, close to I-70. Having just begun their hike at Harper’s Ferry, they were full of determination. “Where are you hiking to tonight?” Maple asked. “Maine” was the answer. “I hope you are planning to spend the night a little closer than Maine,” Maple delicately responded. “Maine” was again the retort. “We have to keep our sights on our destination,” was their explanation. We would leap-frog with them several times during the day, as we and they rested. When they shared with us that their destination was Raven Rock Shelter, my first response was, “That shelter was dismantled two years ago,” but then—upon checking AWOL’s guidebook, it confirmed that the shelter was still there. As it turned out, the old Raven Rock Shelter was, indeed, dismantled and moved to the new AT museum to be opened at Damascus, VA., but a new, two-level shelter has been erected in its place. Maple and I filled our dromedary at the creek, and proceeded to Ensign Cowall Shelter, 8.6 miles into our hike. We were eager to set up our tent before the rain began. And surely enough, once we were set up and had introduced ourselves to those at the shelter, the rain set in—not to stop until about 4 a.m. We moved our cooking equipment and food in order to prepare our dinner at the picnic table under the overhang of the shelter. There were a couple of other flip-floppers there, one extremely talkative older man who just loved to hang out at shelters, and—later—one father with his two children, aged eight and ten, who were hiking 20+ miles a day and deciding whether or not to hike the whole AT. At 5:00 the following morning, it stopped raining. Maple and I got up as soon as there was daylight, packed up our wet tent, prepared oatmeal for breakfast, and were on our way two hours later. We had a couple of engorged streams to cross that posed a bit of a risk and got our boots wet, and two and a half hours later we arrived at the new Raven Rock Shelter. The wood was new and beautiful, but the interior had been irreparably scarred by someone with an alcohol-burning stove. What a shame! Just before we got to Raven Rock Shelter we met the sullen man we had the privilege of meeting the day before. “Hi! How you doin’,” Maple asked. The mysterious stranger mumbled something under his breath, and we passed on by. I think that this man was the most unfriendly person we have ever met on the AT. The AT is an especially social trail. It intersects with towns at so many places that you cannot reasonably expect to hike an entire day without meeting people. This sometimes happens, but it is rare. Maple and I have met the most friendly people on this planet on the AT. They are people who not only expect to meet other people, but who look forward to it. There are even people on the trail who do not hike it, but who are on it with the sole purpose of offering “trail magic”—that is, food, drink, transportation into town, or some other kindness to those who are hiking the trail. For many people, hiking the AT has been a way of renewing their faith in humanity, because of all the many kindnesses that they receive upon their way. So, this unfriendly person was an anomaly, a rare species, and because he was so rare I thought I should mention him. But, moving on, Maple and I came to High Rock, where we had to descend rock and boulder after rock and boulder for 650 feet. We had to be quite careful not to slip upon the wet rocks and tree roots along our path. When we got to the bottom and had 2 miles yet to go, the rain commenced again. Maple and I donned our rain gear. We could have complained, but we were grateful to have made it so far without it raining. Soon, we were in our car; we turned up the heat, got out of our wet clothes and into dry ones, and were on our way back home. Birch and I were shuttled to Elk Garden this morning, starting a three day backpack trip to Damascus. Throughout the week, the weather forecasts were dismal. Tons of rain! Thus, we were pleased to be able to start our ascent up White Mountain in dry weather. The trail leading up to White Mountain was very icy and – in some places – covered with snow. The crampons that we left in the car would have come in handy. Once on the top of the mountain we were quite pleased with ourselves because we assumed we had experienced the worst of the weather. Then….the wind! The area near Buzzard Rock was exposed to the elements and practically blew us over. As we began the 200+ ft. descent we found the south side of the mountain to be warm and gorgeous. There were a few showers here and there but it wasn’t a challenge. The last mile before the shelter was not difficult but we have not hiked in 3 months so my body was complaining all the way. Lost Mountain Shelter is huge. The water supply was great. It had a big overhang which sheltered us as the rain finally came. Wow! It poured last night! By morning it was drizzling. Birch and I made quick work of the first part of the trail but, once again, I complained about all the ascents. At times it was pouring but it was fairly warm out (for February) and we were sweating in no time. I’m not sure if the inside or the outside of my rain gear was more wet! 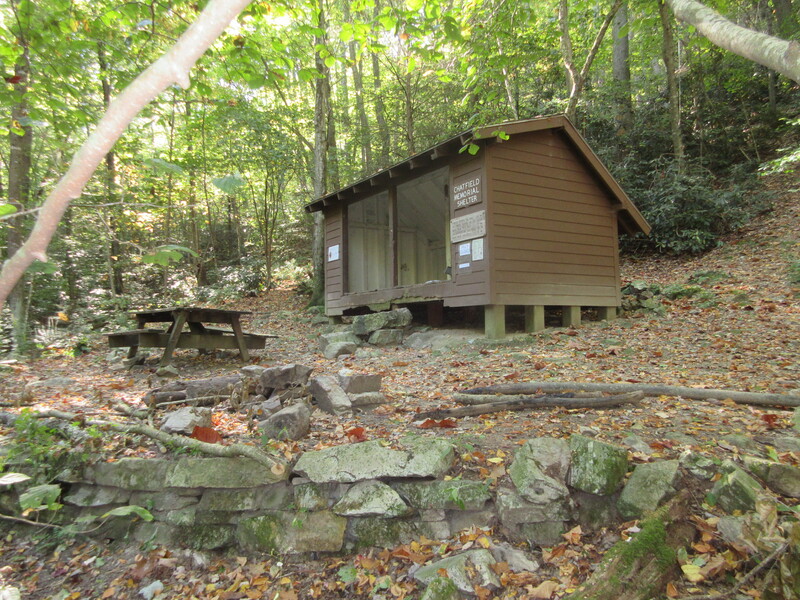 Saunders Shelter is 1/4 mile off the trail. It is not as big as Lost Mountain but well built, with a nice large overhang to protect us from the rain. By late afternoon it stopped raining and we slowly dried out. But it took a while! By the way, we have not seen a single person on the trail so far. I guess the weather isn’t for everyone. By our third day, it was drizzling just enough to convince us to wear our rain gear. Fortunately, we really didn’t need it. it was a cloudy and foggy day but relatively dry. A two mile, 1000 ft descent brought us near Whitetop Laurel Creek and the Creeper Trail, a nice bike trail that paralleled much of AT in the area. This is a beautiful area worthy of a day hike. The creek is beautiful. We were told that a brand new bridge opened near the Rt 58 crossing and so we were excited to be one of the first to use it. After crossing it and Rt 58 we were surprised to find a swollen creek that had water running well above the rocks. We were disappointed to realize that we were going to have to remove our boots, take off our rain pants, and hike up our pants in the cold weather. Birch crossed then realized that his boots were still on the other side. Thus, he had the joy of crossing three times. We hiked up to Cuckoo Knob (about 700ft in 2.5 miles) then came down into Damascus. The Creeper Trail, the AT and Rt 58 all merged together for the last leg of our journey. How sweet it is, after 550+ miles in Virginia, to walk into the ultimate hiker town and the southern most part of Virginia! October is a beautiful month for hiking. Birch and I met up with Sabrina from Eller Taxi Service early Saturday morning. Sabrina is friendly and knowledgeable. She helped us to drop off our car at our destination (that had a very nice parking lot) and take us to Mt. Rogers Visitors Center for our start. Birch and I breezed through the first four miles. The trail is level and easy. We stopped for a snack at VA-601 and continued on. Both of us carried extra water. This area has been pretty dry and we were worried that the spring at Trimpi Shelter would be dry. There were promising signs along the way, however. A stream listed as “intermittent” in AWOL was running just fine. About 3 miles before Trimpi Shelter we walked across a field. By now, the day had warmed up and Birch and I were soaked with sweat! Luckily, it was only another mile to the shelter. Up we climbed until we reached the turn off to Trimpi. Trimpi is a solid stone shelter with a fireplace. We set up our tent and ended up having the place all to ourselves. Although the day had started off cool, there was no need to make a fire so the beautiful shelter went unused. One of the best things? The spring was running (yay!) so we didn’t need to worry about water. We relaxed, read (using our Nooks), drank coffee, and enjoyed watching the falling leaves. The next day, we had a 4 mile hike back to our car. The first 2.5 of it was a steep 1,000+ ascent. It was a perfect day, with cool weather, a nice breeze, and plenty of sun. The leaves were dropping like crazy so I don’t expect us to see these beautiful colors again for another year. 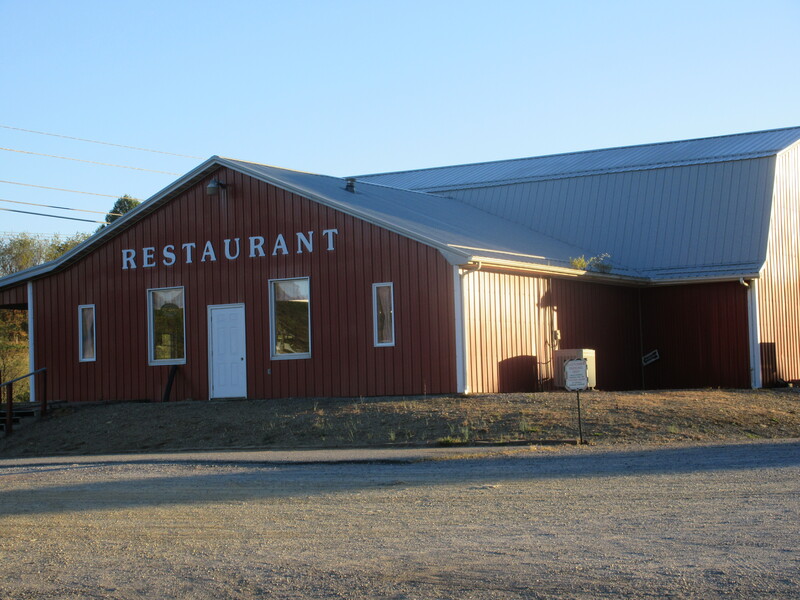 On this frosty October morning, Maple and I checked out of our hotel in Marion, parked one of our cars at our destination on VA-16, across from the Mount Rogers Recreational Visitor’s Center, and then drove to the Barn Restaurant, where we parked our other car and began our hike. 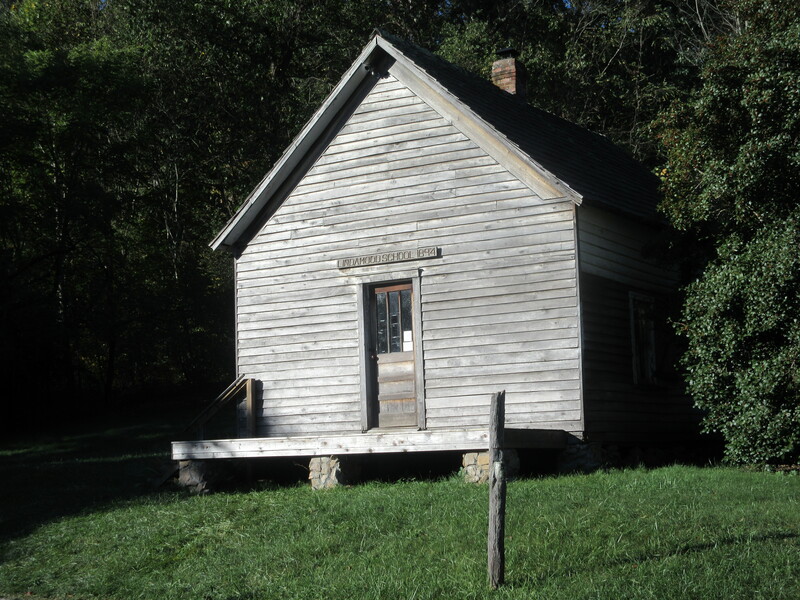 Soon we reached the Settlers’ Museum of Southwest Virginia, which was closed, but I took a photo of the 1894 Lindamood Schoolhouse. We pressed on and soon arrived at the Chatfield Memorial Shelter, which has a running piped spring. It would have been a nice place to spend the night, but Maple and I were on a day hike and had a tight schedule. From the shelter it was uphill to the top of Glade Mountain, where there was nice overlook of Walker Mountain to the west. We could also see I-81 from this location and were surprised to see how far we had walked in less than three hours. Here, Maple and I took a short break to make ourselves a cup of pumpkin spice latte. Um, that hit the spot on this chilly morning! A mile or so later, we arrived at FR-86, where we made ourselves a hot lunch of noodles with chicken. By this time, the outside temperature was comfortable. The sky was a rich hue of blue. And the trees were still green, for the most part. We took in the beauty around us and enjoyed ourselves. On Locust Mountain we met the only fellow hikers we would see this day, a couple who had, over the years, section hiked from Springer Mountain to as far south as where we met them. Like us, they were hiking as their schedules permitted, a little at a time. All to soon, our hike was over. But, as we had a 7-hour drive ahead of us, back to Maryland, we were glad to get back to our cars. Until next time. After a month off the trail, Birch and I were eager to get back on the AT. This time, because of the lack of shelters on our route, we decided to do a day trip. Be began our hike just off VA-42, which is a nice well-paved road with plenty of parking. Although the first mile of the hike is through farm land it wasn’t long before we turned into the woods and began making our ascent to Big Walker Mountain. It was a glorious day! Cool temps, bright blue sky, a pleasant breeze, and just a hint of leaves turning color. Although steep, getting to the peak was easy. We stopped for coffee so that we could take in the beautiful view and enjoy the weather. Before long, we got to a campsite and promptly marched ourselves off the trail. Although we were clearly on some path, it wasn’t the AT. Walking back to the campsite, we searched for the white blazes and got back on track. According to a sign, this spot marks the 1/4 point Northbound. We stopped for lunch at the former Davis Path Campsite. This area has a picnic table and a privy but the shelter is long gone. We then hiked the remaining three miles to where our car was parked. On the last mile or so, we ran into a group of volunteers doing trail work. The group included a couple of high school students putting in their volunteer hours that are required for graduation. I don’t think they had ever been on the trail before but I hope they were inspired to hike! Fall is my favorite time to hike. However, it isn’t without challenges. The water situation was pretty precarious. Anyone hiking this area should make sure to bring plenty of water. Otherwise, this is a wonderful 11+ mile day hike. Two traveling souls in search of the next adventure... and their next meal!